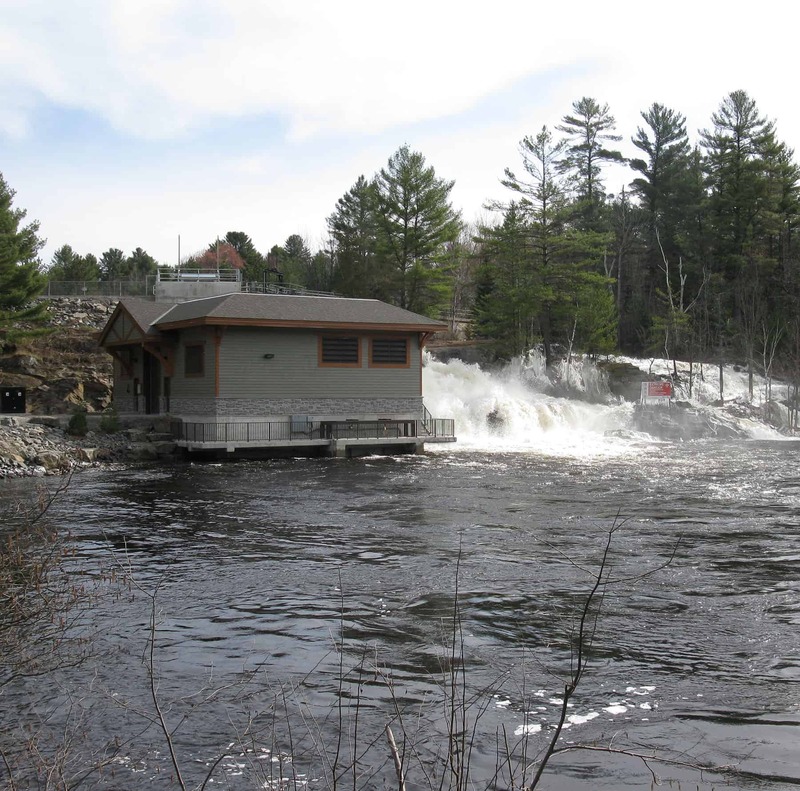 Hydroelectric power generation has occurred on the Muskoka River watershed since the late 1800’s. The Muskoka River watershed is located in central Ontario’s lake country, with the main population centres being Huntsville, Bracebridge and Gravenhurst. The watershed originates on the western slopes of Algonquin Provincial Park and extends southwesterly for a distance of some 210 km to Georgian Bay. The watershed encompasses an area of approximately 5100 km². Bracebridge Generation has 4 facilities on the North Branch Muskoka River from High Falls to Bracebridge Falls. • Watershed receives approximately 1,032 mm of annual precipitation. • Strategy of a longer duration of spring levels for fish and wildlife habitat and reproduction. • Gradual lake water level reduction throughout summer enhances base flow conditions and water quality in river reaches downstream of dams. Watershed Location: This dam is located on the North Branch Muskoka River in the Town of Bracebridge. It controls a drainage area of 1523 km². Structural Characteristics: The dam is made up of a concrete weir with 1 sluice gate. History: Prior to 1945 all local electric motors were 2 phase. In preparation for the construction of High Falls all motors in town were changed from 2 phase to 3 phase. The total cost to construct the High Falls plant was $233,000 and at the time created a surplus of about 750 H.P. (560 kW) of capacity. In 2005 Unit 2 was installed at a cost of $4,500,000 upon an original foundation for a second unit. This new turbine is a double regulated Kaplan capable of 94% peak efficiency. Watershed Location: This dam is located on the North Branch Muskoka River in the Town of Bracebridge. It controls a drainage area of 1556 km². Structural Characteristics: There are 2 dams. One dam at the generating station intake includes a stoplog spillway and a sluice gate while the second dam at the top of the falls includes concrete weirs and 1 sluice gate. History: The electric system in Bracebridge proved so successful that power shortage quickly after building Plant 1 (Bird’s Mill) and Plant 2 (Bracebridge Falls) became a problem. The plant cost $50,000 to build and with this new plant Bracebridge’s capacity for producing electricity proved sufficient for the needs of the town and industry through World War I and World War II. In 2010 the plant, penstock and intake were demolished and a new 2.9 MW double regulated Kaplan turbine was installed at a cost of $9,000,000. Watershed Location: This dam is located on the North Branch Muskoka River in the Town of Bracebridge under the Entrance Drive bridge. It controls a drainage area of 1568 km². Structural Characteristics: The dam is made up of concrete weirs with 3 stoplog spillways. History: Bracebridge was the first municipality in Canada, to own and operate a water-power electric generating station on October 1894 when they purchased Mr. W. S. Shaw’s powerhouse for $3,500. Originally built in 1892 the plant produced power for the Shaw, Cassels Leather tannery and 20 street lights under contract to the town. The Town upgraded the equipment and converted one generator to a pump. This allowed for a water main up Manitoba Street and fire hydrants which were much needed. Once Bracebridge Falls GS was built, Bird’s Mill was soon after fully converted to a turbine driven water pumping station. Watershed Location: This dam is located on the North Branch Muskoka River in the Town of Bracebridge. It controls a drainage area of 1568 km². Structural Characteristics: The dam is made up of concrete weirs with 2 stoplog spillways and 1 sluice gate. History: When Bracebridge Falls GS was put in service at the beginning of 1902 costing around $12,000 to build. Bracebridge Council encouraged local industry to use electricity to replace steam power generation. By the end of 1904 there was again a shortage and Unit 2 was installed in 1905 for a cost of $5,800. The plant was now capable of 0.6 MW and due to surplus power, Bird’s Mill was then converted to a water driven pump. In 2010 the water passage of the plant, penstock and intake were demolished and a new 2.9 MW double regulated Kaplan turbine carefully installed under the existing buildings at a cost of $11,000,000.